Mike Ditka is a famous Coach from USA, he is 79 years old and still alive, born October 18, 1939. Michael Keller Ditka, Jr (born in Carnegie, Pennsylvania), also known as "Iron Mike", is a former player, former head coach and former football commentator. He played in the NFL tight end position 1961 to 1972 with teams Chicago Bears, Philadelphia Eagles and Dallas Cowboys. Ditka was coach with the Chicago Bears for 11 seasons with the New Orleans Saints for 3 years. Ditka and Tom Flores are the only two people who have won Super Bowls in the positions of player, assistant coach and head coach. 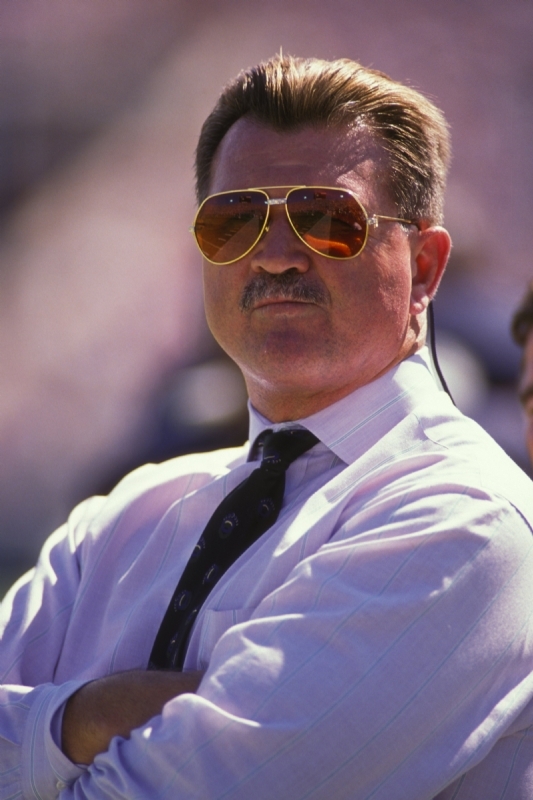 Ditka is the only person (to 2008) who participated in the last two championships in Chicago in 1963 as a player and coach in 1985. He is born under the zodiac libra, who is known for Balance, Justice, Truth, Beauty, Perfection. Our collection contains 33 quotes who is written / told by Mike, under the main topics: Diet, Fitness, Health. "We have a strange and wonderful relationship - he's strange and I'm wonderful"
"There's just me and my wife and a dog and we feed him Healthy Choice also"
"The ones who want to achieve and win championships motivate themselves"
"Success isn't permanent and failure isn't fatal"
"Success isn't measured by money or power or social rank. Success is measured by your discipline and inner peace"
"Some people are willing to pay the price and it's the same with staying healthy or eating healthy. There's some discipline involved. There's some sacrifices"
"So, when it comes to eating healthy, it's just doing the right thing. And it's not something you have to do 365 days a year, but I think it's something you have to do 25 days a month. Let's put it that way"
"Really, if I'm gonna eat a meat, I'd rather eat venison than anything and I do like it a little on the rare side. That's probably my favorite meat and I've had some awfully good venison in some of the great restaurants"
"People want a cop-out, listen I'm a realist and I talk about motivation, talk about all the things it takes to be greater or are important to win and people want to use excuses all the time"
"One of my favorite things is mayonnaise and I have to tell you that. I love mayonnaise, but I don't eat it any more. If I do I put light mayonnaise on it, which I know is still not good but it's a lot better than the other one and I don't eat it that much"
"Not really, and actually my cholesterol was 190 when I had the heart attack. 190, which isn't that high. I took it down to about 130 and it's probably about 140 or 145 now"
"Just because you liked something as a youngster doesn't mean you have to like it as an adult. You can change your taste a little bit on the sweets and things like that"
"It's your body and you're going to have a much better life, you are going to have a quality life, better lifestyle, you're going to be healthier, you're going to be happier, you're going to enjoy the people around you and they're going to enjoy you more"
"If you are determined enough and willing to pay the price, you can get it done"
"If things came easy, then everybody would be great at what they did, let's face it"
"If God had wanted man to play soccer, he wouldn't have given us arms"
"I've been into the habit of freezing white grapes and using them as a snack. Instead of eating peanuts or popcorn or something like that or pretzels, I just eat the white grapes"
"I'm not going to make it the all - everything. Our (the Saints) goal is to get better, make the playoffs and win the Super Bowl, but I'm not gonna anguish over it like I have in the past"
"I think your alcohol intake has to change. You know, usually a big person feels they can drink anything they want to and as much as they want to and I've cut that way back"
"I think it's important to stretch as you get older, but I try to do basically all the things I did when I played, except I can't do them as well and as much"
"I mean, when you've had a problem in your past, whether it's attributed directly to high cholesterol or not, you want to lower your cholesterol. You want to eat healthy. You want to feel healthy. You want to have a little more energy"
"I don't know how to put it, but yet you know we have so many people who the way they look at life, the way they work depends on what happens, us winning or losing. It's kind of crazy. So, I kind of got caught up in that, I'm gonna try to stay away from that"
"I do some weights and I do a lot of stretching"
"I do like beer, but lately I've started drinking non-alcoholic beer and I like the taste of it and I don't get the alcohol, so that's a good alternative also"
"I always tell people I want to live to be 150 and they say why would you want to do that. I say, well there's a few people I haven't made mad yet, I want to get them"
"Eating properly is great. I mean you cut the fat down, cut the cholesterol out, but still you got to get your rest and you got to have some form of exercise"
"Before you can win, you have to believe you are worthy"
"Basically, my problem was attributed to stress more than anything. I don't know what that does and I guess doctors can tell you that there's chemicals that build up in your system when you go through a lot of stress and constant stress"
"When I get my heart rate up, I get good exercise and I think it's good for a lot of things, plus it's not hurting my hips right now"
"What you feel spiritually. I think a lot of that has to do with it. If you have no spiritual life, chances are everything is going to aggravate you, you're going to fly off the handle at everything and that's what I did in the past. I've kind of got that under control now"